To be honest, I don’t really care which is the better smartphone (or super-duper phone): the iPhone 3GS, the Motorola Droid, HTC’s Droid Eris, Google’s Nexus One, Nokia’s N900 or the Palm Pre. It’s just great to witness this seemingly never-ending advancements in mobile technology, both on a hardware and software level, and to see increased competition drive innovation at such rapid pace. Just compare the market today to five years ago, and you can’t help but be amazed by how far we’ve come – I still remember my epic struggles to get my previous phone (HTC S710 with Windows Mobile) to do half of what I really wanted it to. In short: if all phone manufacturers keep on pumping out better phones, I’m a happy camper (for the record: I’m still very pleased with my iPhone 3GS as my primary device). But comparisons will be comparisons, and MOTO Development Group this morning announced the results of its DIY touchscreen analysis, based on some touchy testing of the capacitive screens of the Nexus One, the iPhone, the Motorola Droid and HTC’s Droid Eris. MOTO has a lot of experience developing products that use capacitive touch, and its team members have put their fingers on a good number of smartphones over the past few years. 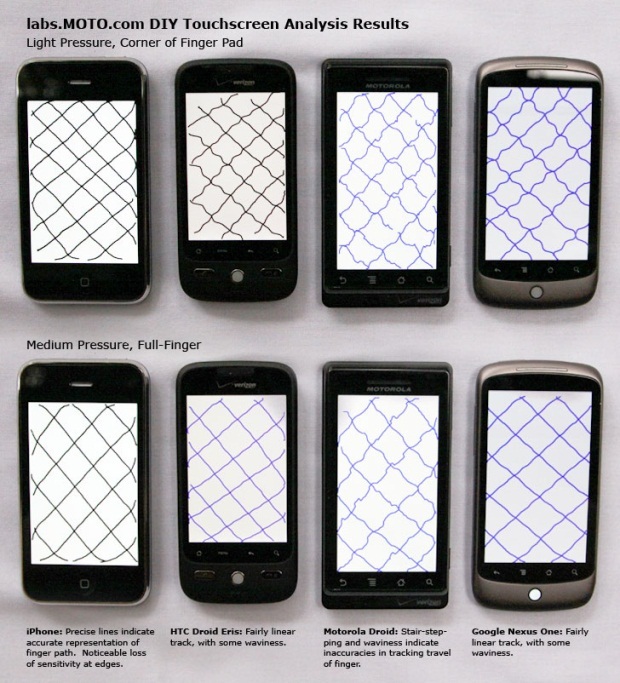 After using DIY techniques to test touchscreen performance (see video below) in combination with more sophisticated testing tools, MOTO has concluded that not all touch-screens are created equal. And that the iPhone’s screen performs slightly better than that of its rivals. Are you happy with your smartphone’s touchscreen performance?